Since the NFL is back I thought it would be cool to have a thread on how the Bama rookies are looking so far. I only watched the Redskins vs Ravens game so most of what I know of the other Bama rookies is from others opinions and observations. I'm sure I'll forget someone but I did my best to at least list all of the big ones. Tim Williams - made a special teams tackle but I didn't see him make a ton of noise rushing the passer. Jonathan Allen - played well in somewhat limited snaps. He had a sack that was caused by good coverage by the DBs but he played with discipline and was there to take down the QB when he tried to scramble. Ryan Anderson - He looked fantastic and seemed to always be around the ball. PFF said he had 2 pressures rushing the passer but his biggest impact was in the run game where he looked great setting the edge. Eddie Jackson - He didn't do much on the stat sheet but I did see a clip of him making a great tackle on a run play. It also sounds like he played some with most of the starters still in the game. He also had a couple punt returns but didn't do much with them. Richard Mulaney - Idk if he counts as a rookie but he had 2 grabs for 70 yards, including a 52 yarder. Last edited by RollTide_HTTR; August 11th, 2017 at 10:23 AM. Thanks, I had also considered creating this thread but you beat me to it. I watched the Redskins & Ravens as well - Redskins have some work to do on offense, especially considering that they were supposed to torch people. Still ,it's very early, I'm sure they'll get it ironed out. I thought both Anderson and Allen looked sharp. Looked like they'd been there before. Will see how the do against stiffer competition in the regular season. CyJo did not have a good night last night. I know he not a rookie any more, but D Henry looks really good on the Titans right now. I took my son to see a Titans open practice on Wednesday and he still looks like a man against NFL talent. 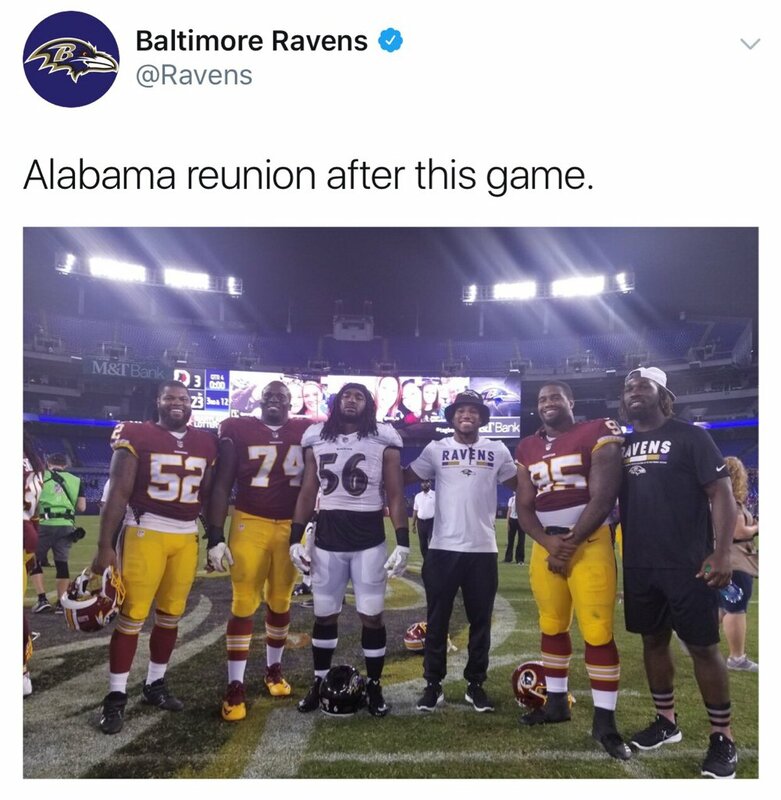 Ryan Anderson, Kouandjio, Tim Williams, Marlon Humphrey, Jon Allen and CJ Mosley. Not all rookies but it's a pretty cool picture anyhow.. The local sports guy here in RVA was talking about how the Skins coaches have been really impressed with Ryan's ability to set the edge of rushing plays...they have their mini-camp here. Allen's legs look like beer kegs. I saw a little of the Chicago game on the NFLN. One of the announcers said John Fox compared Eddie to a HOF safety (can't recall his name). The Bears are very high on Eddie. He did have one 16 yard punt return. Looks like Tim has put on some weight. It has gotten to the point that it seems that every NFL game has multiple Alabama players playing on both teams. I used to just pull for an NFL team that had a Bama player on it while watching a game, if there was a Bama player playing in the game. Can't do that anymore as it seems that it is a rarity to watch an NFL game and not find a Bama player playing for one of the teams. I remember that play. With his motor and technique Anderson could be very good for them for quite some time. I remember 10 years ago it was hard to find one. How times have changed. It seemed like they were all either from Miami, USC, LSU, Florida, or OU.